A long time ago, Cherokees lived on mountains in the southern Appalachia. They lived in villages there. They grew corn , squash, beans, and many other crops. They also were hunters. They hunted in forests. Cherokee hunters traveled over a hundred miles of land that no one claimed but a lot of people used. They trapped rabbits, shot deer with their bow and arrows. They hunted wild turkeys, bears, and fish too. They fished in many streams, rivers, and lakes in the region. They gathered wild fruits and nuts which their land provided. They land provided many resources that the Cherokees could use in the summer. The Cherokees lived in a rectangular house. They had a diferent house in the winter than they did in the summer. In the winter they would live in a smaller more circular hut. They hut walls were made of thick clay and poles. In the center Cherokee village was a big house called a meeting house. In the meeting house villigers celebrated holidays and made important descisions . All the Cherokee adults could express their thoughts and feelings about issues there. The Cherokees would debate until they could all come up with an an agreement. This method is called consensus. After the American Revolution, the settlers tried to get control of the Cherokee land. In the early 1800's, the Cherokees decided to start a new government. The government would help the Cherokees keep their land. They wrote their constitution in 1827. It stated that the land belonged to the Cherokees. The constitution was very similar to the constitution we have. In 1828, when gold was found on Cherokee land the settlers forced the Cherokee to leave their land. 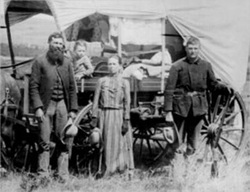 They headed west towards Oklahoma and were forced to walk hundreds of miles without enough food or proper clothing. Many Cherokees died on the walk. This walk was called the "Trail of Tears." Many Cherokees who moved West towards Oklahoma became known as the Western Cherokee. Some stayed in the Southeast. Several purchased land in the mountains of North Carolina. They were known as the Eastern Cherokee. Today the Western and Eastern Cherokee make up the largest Native American group in the US. There are more than 11,000 Cherokees living in North Carolina. Many live on Qualla Boundary reservation. Here, they work to support themselves and keep their culture alive. Juan Ponce de Leon was the Spanish governor of Puerto Rico. He had heard Native American stories about the "fountain of youth." In 1513, he sailed to find the island of Bimini but ended up on the eastern shore of the present day Florida. He named the land Florida after the Spanish term for Easter Sunday because he arrived there on Easter. He never found the Fountain of Youth, but he was the first explorer to discover Florida and claim the land for Spain. He came to Florida in 1539 in search of gold. He explored many areas in the Southeast. He didn't find any gold in the Southeast, but he was the first European to find the Mississippi River. Robert La Salle was from France. He was the first European to sail down the Mountain and reach the Gulf of Mexico. When he reached the end of the river, he claimed the Mississippi valley for his King Louis XIV of France. He named it Louisana in honor of the King. A city founded by the Spanish on the east coast of Florida in 1565. It became the first European settlement in the US. They built a Fort called the Castillo de San Marcos to protect themselves from their enemies. "The Lost Colony" is a group of about 1000 settlers who sailed from England to establish a colony in North America. They arrived in 1587 in what is now called North Carolina. The group leader, John White, left to return to England for more supplies. When he returned, the colony had disappeared. No one ever found out what happened to the lost colony. He was born in Virginia in 1732. He led the Colonial forces againsted the British Army in the Revolutionary War. In 1789, he became the first President of the United States of America. He is recognized for his honesty, bravery, and dedication to the United States. People remember him as the "Father of Our Country." In 1607 a group of 105 people landed near the James River in Virginia. Unfortunately, this was not a safe area and many settlers died of diseases. The nearby Powhatan Indians offered help. Jamestown became a big success. This lef to the founding of colonies along east coast. He was born in Virginia in 1743. He was another leader of the Revoluntionary War. He was the author of the Declaration of the Independence. He was elected President in 1801. He purchased the Louisana Territory from France. He built his home in Virginia and named it the Monticello. He was often called the "Father of Constitution." He was a leader of the Constitutionual Convention of 1787 where the leaders met and wrote the constitution of the US. He became the fourth President of the US. He became President in 1829. He was born in South Carolina in 1767 to a poor family. People believed that he supported and understood their needs. A pioneer is a person who settled in one part of the country and prepared it for others. Daniel Boone was a pioneer. He developed the Wilderness Road that was used for travel by many other pioneers traveling westward. He was born in Pennsylvannia in 1734. A backwoodsman is a person who lives in a forests far away from towns. David "Davy" Crockett was born in the backwoods of Tennessee in 1786. He was a hunter, soldier, scout, and humorist. In 1827, he was elected as a congressman in Tennessee. He was a great leader. After, he moved to Texas and was killed fighting in the Alamo in 1836. In the Southeast the land was flat and was great for farming. Many peopel built plantations. Many owners of plantations, planted tobacco, cotton, and rice. These plantations required alot of work. In the Southeast, many plantation owners bought African slaves to work on their farms. 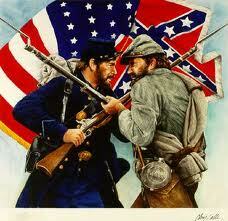 The war between the Northern and Southern states began in 1861. The Northern States were called the Union and the Southern states were called the Confederacy. Slavery was an important issue during the war. The north and the south argued over the whether slavery should be allowed in their country. Abraham Lincoln was running for President in 1860, he agreed with the Northerners. When he won the election, seven states pulled out of the country. They didn't likeLincoln's views on slavery, and four more states joined to form the "Confederate States of America." Many people living in the south died during the war. After four years the South surrendered. Many homes and towns were destroyed. Slavery ended in the South in 1865. The United States passed the 13th Amendment to the US Constituion to make slavery illegal. The former slaves became US citizens. The south began to recover from the war. Reconstruction is the time when South rebuilt it's buildings and economy. This lasted from 1865-1877. The South was readmitted to the US. African Americans were given civil rights. However, many former slaves stayed on the farms because they weren't very skilled in other areas. In 1877, many Southeastern states enforced the "Jim Crow" laws that seperated black people from white peple in public places. This was called segregation. 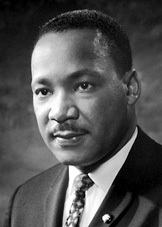 He was an important leader during the Civil Rights Movement. He spoke about segregation and other kinds of unfair treatment. He encouraged people to protest about unfair treatment without violence. He thought this would be the best way to win. Gold Found in Dahlonega, GA! In 1828, gold was found in Georgia. The first gold was started soon after people heard there was gold. The dome of the state capital building shines from gold found during the first gold rush. Before the Civil War, Atlanta was an important place in the Southeast region. During the war, it was destroyed and rebuilt again about the war was over. In 1837, Atlanta started as a railroad center. As the railroads continued to grow, Atlanta also grew. The trains were used to carry goods, to the Northern States. 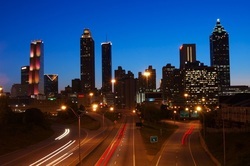 Today Atlanta still serves as a busy area for travel. Atlanta has a public transportation system that is made up of trains and buses to help people get around the city. This helps cut down the traffic in the areas. In Atlanta, new buildings are being built and new jobs are created. Many people have government jobs because Atlanta is the State Capitol. Other southeast cities are growing because many people are moving away from the colder climates.